One of the most sought-after wildlife destinations in the country, Thekkady offers the silence of the Eastern Ghats, nestled in the misty mountains, fuelled with greenery. Thekkady has always been a special place for wildlife and nature enthusiasts and is a perfect refuge from your daily hectic schedule of the city. In case you want to plan a long road trip from Chennai, this place awaits you. The summers in Kerala are sultry and humid. The summer temperature touches 36 degrees; therefore, November to January is considered the best time to visit the place, avoiding the summers and monsoons. However, if you are a wildlife enthusiast, then preferably visit this place during late summers as the chances of spotting wild animals is best during this period in the Periyar National Park. During your trip to Thekkady, you will be passing through the hills of the Eastern Ghats, so make sure you carry a light jacket to avoid getting cold. Thekkady is located in Kerala and is about 570 km from Chennai. This is a long route through various highways, so the route recommended is one with a number of halts where you can enjoy short stays. The above route comprises of travel though various highways like the NH32, NH132, NH38, NH67, NH83 and NH183; therefore, it is recommended to carry a GPS system in your vehicle. In case you are travelling by bike, the make sure to check the route map at regular intervals to avoid going off track. Villupuram is located about 168 km from Chennai and holds a historical significance in the Hindu religion. The Panchamukha Anjaneyar Temple located here is dedicated to Lord Anjaneyar (Hanuman). Also the Ulagalantha Perumal Temple is a holy shrine attracting thousands of visitors and is located in close proximity to your route. Finally make sure to visit the bead-making village, famous for its colourful bead-making art that has acquired attention all over the world. The ancient city of Trichy is just 168 km from Villupuram and is a perfect place for your next halt. The Sri Ranganathaswamy Temple is located around the Srirangam Island with the Kaveri and Kollidam rivers flowing around it. The temple has intricately carved towering gateways or gopurams that reveal the marvel of ancient architecture. To make a silent spiritual contact with the heavenly abode, a visit to the Jambukeswarar Temple is a must. 163 km ahead of Trichy lies the silent town of Periyakulam. Kumbakkarai Falls is located on the foothills of Kodaikanal hills. The falls cutting the steep rocks, pronounced by ancient geomorphic processes, is a silent place nestled between thick and luscious vegetation. The serene atmosphere near the falls is perfect for a short visit; however, evening and late-night visits should be avoided. The place has fewer visitors and is a marvel kept hidden, therefore, silence is paramount. Also make sure you carry an extra pair of clothes. 80 km ahead of Periyakulam lies Thekkady in the Idukki district of Kerala. The place is the location of the Periyar National Park, located on the banks of the Periyar Lake. It is considered as a haven for natural spices whose cultivation fills the aroma of the atmosphere. 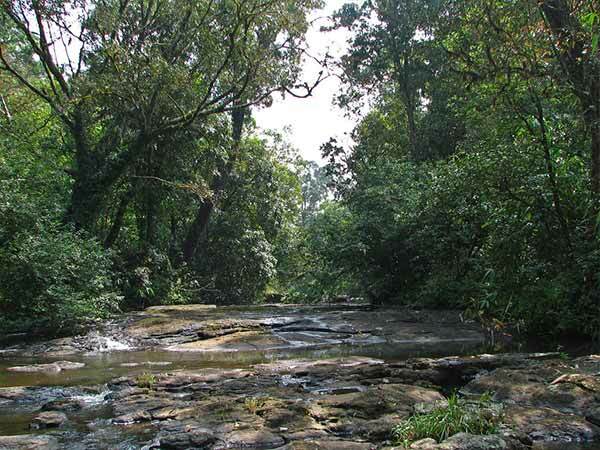 The place is filled with dense evergreen forests along with the savanna grasslands, which absorb you into its wildness. Wait! We are not yet finished. The trekking, boating, elephant and jeep safari add to its charm. The Periyar Tiger Reserve is located along the Periyar Lake and is accessible by boat, which is available at the sanctuary counter. Wild animals, like gaur, elephant, sambar and Nilgiri langur, can be easily spotted near the lake. The interior of the sanctuary is accessible by jeep and elephants, which take you to the inner core of the jungle. Here wildlife is seen in action and interaction with nature. Spotting tigers is also easier here. Do not forget to carry your camera and adequate water. This place is perfect for family boat rides and enjoying the sunset along the dam. The local fruit sellers sell fresh and mouth-watering fruits. The dam shows the modern strength of Indian architecture. The 5 km dense and well-segregated arena of Green Park is a place that truly tests your smell receptors. With various medicinal plants, herbs and spices, the place also has beautiful huts that make the most wonderful boutique stays along with several centres selling their produce. In the evening, the Kadathanadan Cultural Centre hosts a brilliant and jaw-dropping show of ancient martial arts, involving fire and tumblers. The valiant warriors of Kalaripayattu and elegant dancers of Kathakali bring out the best of the cultural history of the place.